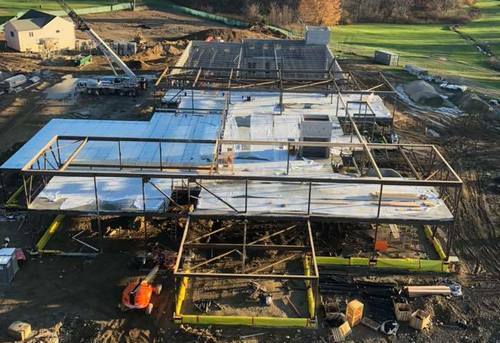 The Board of Selectmen agreed to a negotiated 10 extra unpaid days for contractors to finish the Public Safety Complex this summer. They also agreed to pay the $350K needed to construct carports for cruisers. The town has negotiated with the contractor of the new combined police and fire stations after the company wanted an extra month to complete its work. Selectmen just before Thanksgiving also agreed to ditch a plan to have a private company install solar canopies for police cruiser carports on the property. After a series of letters between the general contractor and the town’s project manager, the town gave the contractor an extra six working days or 10 days total, according to Jason Malinowski, chairman of the Public Safety Building Committee. . .
CTA Construction of Waltham now has until July 10 to complete the project. The town hoped to work with a company to lease space to build the solar carports, but after two rounds of bids no companies returned bids. Four days prior, the committee released its latest monthly newsletter update by the Owner’s Project Manager. That recapped progress through the end of October. (You can open it here.) According the newsletter, the project was at 25% completion. The update indicated parties were in process of talking through schedule delay requests. Since I never posted the September report, I’m sharing that link here as well. For more pictures of the project progress, check the Southborough Fire Department Facebook page. Wow, $350k for 10 carports?!? Seems like a lot, does anyone have the back story on this? I don’t know where you got the number 10, so I don’t know if that is accurate. I couldn’t find how many canopies or how many cars they are meant to cover. I will reach out to the chair to see if he can provide some more context. unfortunately with the cost of steel and concrete these days, this is partially a product of the cost of labor coupled with the tariffs attached to these items. Thankfully, the bids for the building itself went out and were back before items such as steel had a tariff attached to it. If we were bidding today, as opposed to last Spring, we likely would be looking at a very different result not in our favor. Given that the police do not have any garage space for their cruisers, it was necessary to still keep them for the police side to deal with inclement weather, etc. we chose not to accept the cost until we exhausted all avenues to make sure it was a cost that we should actually be paying for, as opposed to finding alternative sources of funding for such as the solar that firms ended up not replying to. I’ll start with one that is probably like what we are getting, but this town was able to build an 18 vehicle canopy for 140k. In case anyone though my 1/10th of 350k was inaccurate, (I was assuming 10 spots) This one got a 6 vehicle carport for a mere 17k. This one also almost got fleeced for 350k, but they were smart enough to reject the bid as they expected the cost to be around 100k. These towns got theirs for free due to solar usage. This town was requesting 90k for their carport, but it got rejected as that was determined to cost too much. This town estimates theirs should cost 150k. Yes 350k is a lot, it should be about 1/10th that. But this is the taj, so I’m assuming they’ll be using all marble in which case to cover less than 2000 sq ft of parking lot at roughly $100 a sq ft for marble, 350k is well still too high. we own 19 police vehicles? seems like a big number for our small town. And frankly, I’d much prefer most of them were rolling around town enhancing our safety and preventing potential crimes.